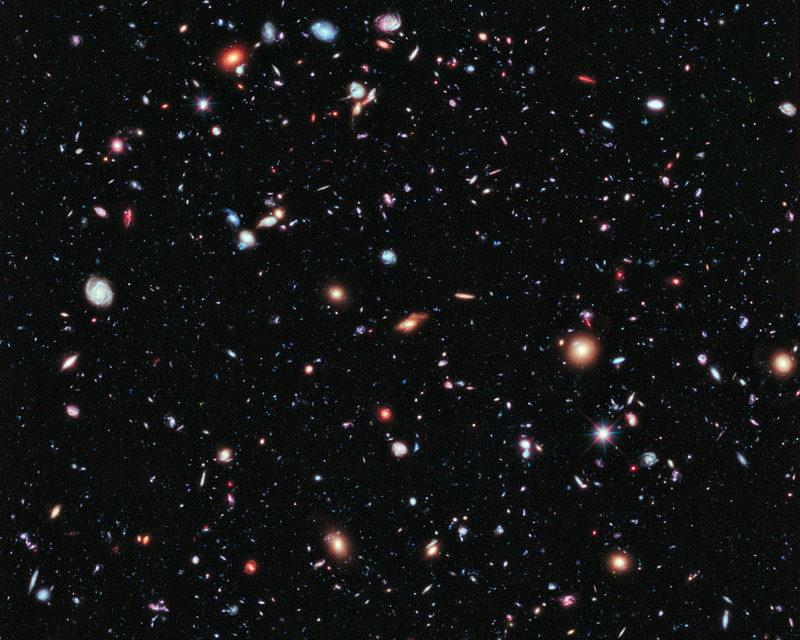 This image, called the Hubble eXtreme Deep Field (XDF), combines Hubble observations taken over the past decade. With a total of over two million seconds of exposure time, it is the deepest image of the Universe ever made. ASTRONOMERS HAVE ASSEMBLED a new, improved portrait of our deepest-ever view of the Universe. 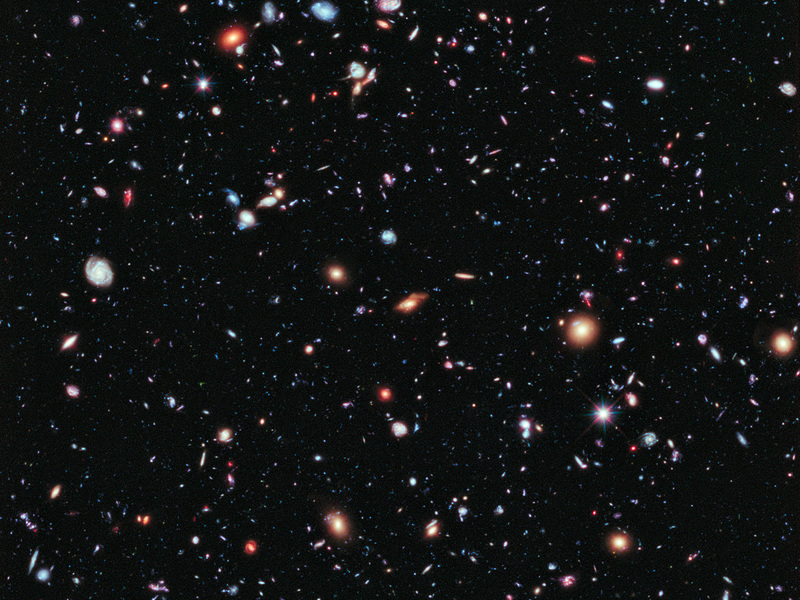 Called the eXtreme Deep Field, or XDF, the image was assembled by combining ten years of NASA/ESA Hubble Space Telescope observations taken of a patch of sky within the original Hubble Ultra Deep Field. The XDF is a small fraction of the angular diameter of the full Moon. The Hubble Ultra Deep Field (UDF) is an image of a small area of space in the constellation of Fornax (The Furnace), created using Hubble data from 2003 and 2004. By collecting faint light over one million seconds of observation, the resulting image revealed thousands of galaxies, both nearby and very distant, making it the deepest image of the Universe ever taken at that time. The new full-colour XDF image is even more sensitive than the original UDF image, thanks to the additional observations, and contains about 5,500 galaxies, even within its smaller field of view. The faintest galaxies are one ten-billionth the brightness that the unaided human eye can see. This view of the XDF image contains shows of the most distant objects ever identified. Among these are: UDFj-39546284, at a redshift of 10.3, is a candidate for the most distant galaxy yet discovered (awaiting confirmation); Supernova Primo, at a redshift of 1.55, the most distant type Ia supernova ever observed; UDFy-38135539, at a redshift of 8.6, is the most distant galaxy to have had its distance independently corroborated; UDFy-33436598, at a redshift of 8.6. Hubble pointed at a tiny patch of southern sky in repeat visits made over the past decade with a total exposure time of two million seconds. 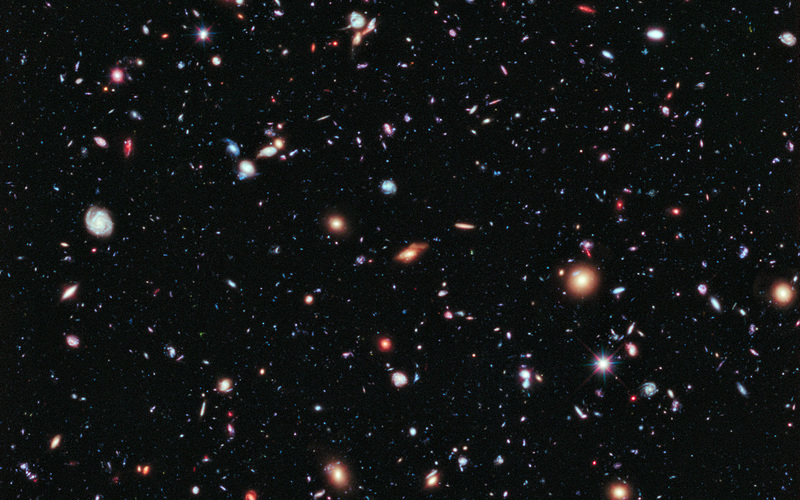 More than 2,000 images of the same field were taken with Hubble’s two primary cameras: the Advanced Camera for Surveys and the Wide Field Camera 3, which extends Hubble’s vision into near-infrared light. These were then combined to form the XDF. The Universe is 13.7 billion years old, and the XDF reveals galaxies that span back 13.2 billion years in time. Most of the galaxies in the XDF are seen when they were young, small, and growing, often violently as they collided and merged together. This image from the Digitsed Sky Survey shows the area of the Hubble eXtreme Deep Field (XDF), with the full Moon shown to scale for comparison. The early Universe was a time of dramatic birth for galaxies containing brilliant blue stars far brighter than our Sun. The light from those past events is just arriving at Earth now, and so the XDF is a time tunnel into the distant past when the Universe was just a fraction of its current age. The youngest galaxy found in the XDF existed just 450 million years after the Universe’s birth in the Big Bang.